My brother's boss gave him a 5 pound zucchini this past weekend. The thing is so huge! I placed a fork next to it to give you a good perspective of the sheer size of it. His boss says that when he came back from vacation, his zucchini quadrupled in size. He doesn't use fertilizer or anything to induce growth yet all of his vegies grow abnormally big. Every year, his garden yields a bounty of fruits and vegetables without fail. I think he has a combination of good sunlight and super soil. My garden on the other hand requires a lot of hard work and yields nothing edible. My cherry tomato plant grows nicely every year but none of fruits are edible. There's just something weird about those tomatoes. They don't seem to progress to the ripe stage. I've had it for 3 or 4 years now and I'm thinking of just yanking the entire thing out because it has grown quite big and is taking up a big space. Aside from my tomato plant, I once had a zucchini plant. It did well for one growing cycle and then got infected by a disease or something. I don't know if it's my soil pH balance or if it's because there's simply not enough sun to grow stuff in my garden. It's mostly cloudy and foggy in my neighborhood. 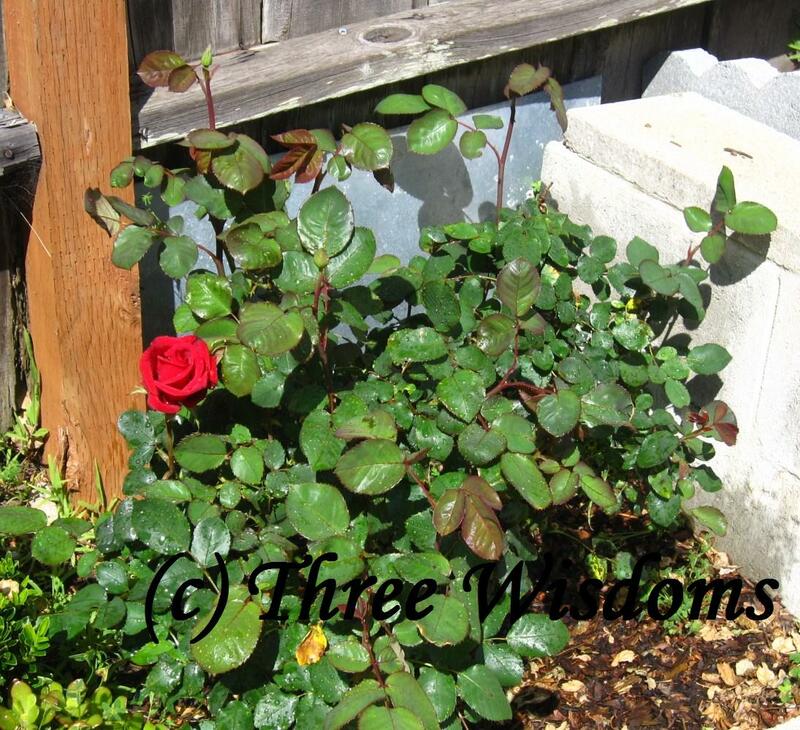 I'm most proud of my red rose bush since it is the only plant thriving while all the others have stagnant or no growth at all. The roses are very fragrant. I've had the rose bush for a year now and it has continuously blossomed. The only problem is pests eating on the leaves and the roses. I have to figure a way to get rid of those critters without the need to use insecticide. Do you know of a safe way to get rid of garden pests? I tried and failed with a garden :( I will try herbs again next year, though! Our garden fails miserably. You have a great Rose Bush. All we have left is sticks with a couple of leafs stuck to it. Even though, all that happens to be my fault, I don't count that. That zucchini is huge. Looks like your brother's boss has an amazing garden. I always envy those people who can grow anything. A 5 lbs. zucchini will last for many meals. To rid aphids on roses, spray them with a mixture of dish soap and water. I don't know a thing about how to get rid of the pest! I wish you luck with that! That zucchini would make awesome zucchini bread!! @Ummie - no, it's not a cucumber. Zucchini is a squash that looks like a cucumber. 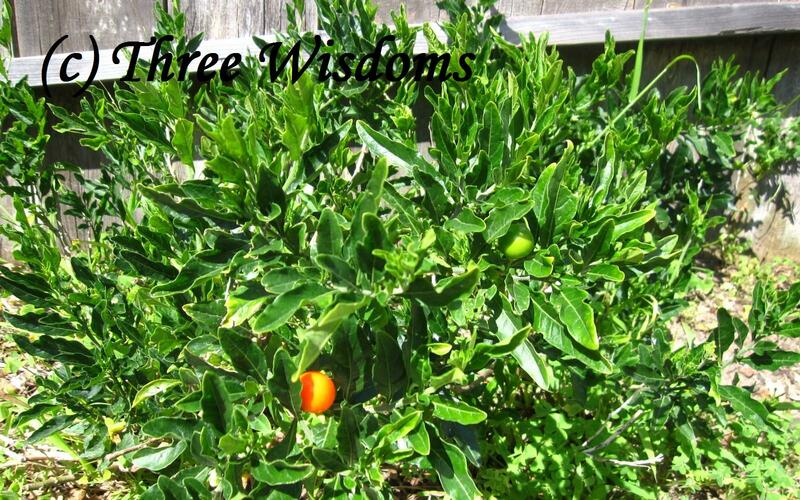 Your garden soil probably lacks nutrients. Organic fertilizers should done the job. My mom told me that she sprays organic enzymes on the plants to keep the insects away. The making of home-made enzymes is a huge hit here. I do not have a green thumb, so I cannot share any advise. But my friend saves all vegetable peels and feed them in their soil (compost?) and she produces great vegetables. In my own opinion, it has something to do with the soil, too. Wow that's a huge one! 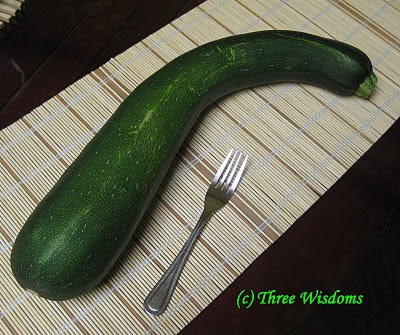 I love zucchini and I have a friend who plant zucchini at her backyard but they never grow that big.. I don't have a garden so no pests to deal with. That's one huge zucchini. Is your brother going to cook it? 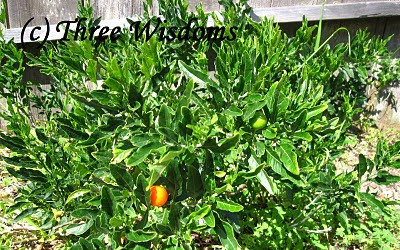 I hope your garden responds to blog bashing like mine did. I even have tomatoes ripening. Can you believe it? That zucchini looks delish! I have an insect problem, too. Japanese Beetles eat my crepe myrtles. Drives me nuts, but nothing seems to work on them. Good luck getting rid of yours. Now that's a whopper of a zucchini! Girl, you've god aphids...nothin' to be ashamed of. I've tried the natural way of treating my 38 rose bushes and have given in to 3 in one commercial fungicide treatment that takes care of mites, insects and fungi. My bad!!! God bless and have the most beautiful day!!! i know nuts about gardening. Thanks for dropping by and commenting on my latest post! You can read more items from the article source. I just listed down those that I find common across blogging world only. Thanks for your feedback! Btw, I love the red rose too! That is a HUGE zucchini! I laughed my head off about your faithful gardening and then it's demise. Darn it. That zucchini's really big! I wonder how it tastes?